The selection of designs shown in this gallery are examples of previous work commissioned for weddings and anniversaries on a variety of articles. Full details on having an individual piece especially created for you can be found on the Commission page. 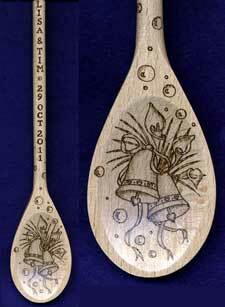 Wedding spoons in beech or sycamore inclusive of personalisation with design of choice, together with names of the couple down the handle and date of the wedding. Also suitable for special anniversaries. Approximately 12" long trimmed with ribbon available in a wide range of colours threaded through a hole in the top of the handle for hanging. 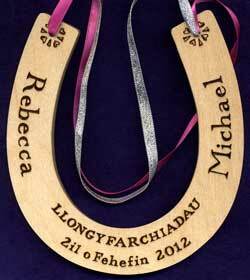 A larger size (not illustrated) in beech with a shaped flat handle suitable for extra long names/messages also available. 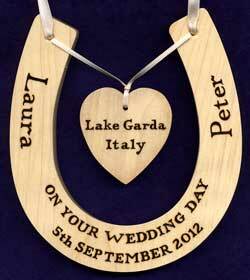 Illustrated above are the "standard" and "deluxe" wedding horseshoes. Both are inclusive of personalisation with names of couple, date of wedding, brief message (4 words, 20 characters maximum) of choice and are trimmed with ribbon available in a wide range of colours through holes in top. Also suitable for milestone birthdays, anniversaries, etc. The "standard" horseshoe is made of quality birch faced ply (approx 6" x 5.5" x 1/4" thick) and has a small heart design around the ribbon holes. The "deluxe" is solid sycamore (approx 6" x 5.5" x 3/8" thick) strung with a sycamore heart (approx 2") which may be personalised with an additional 2-3 word brief message. To see further examples illustrating a variety of commissioned brief messages, please visit the Horseshoe Commissions page. 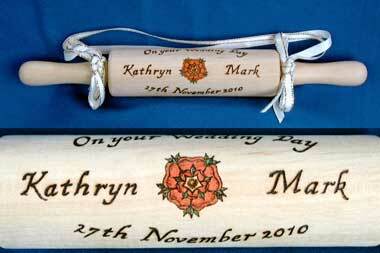 Solid beech mini rolling pin (approx 1.5" dia x 12") inclusive of personalisation with design of choice together with message, names of couple and date of wedding. Trimmed with ribbon available in a wide variety of colours. 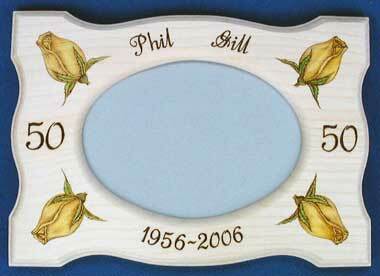 Commemorative wedding anniversary solid sycamore frame fitted with glass and supplied with both a hanger and stand. Here the pyrographic shading of the corner motif rose design has been enhanced with coloured lightfast inks to suit the theme. 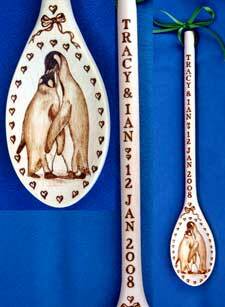 Design and personalisation details can be adapted to suit any special anniversary or occasion. Size of frame shown approx 5" x 7" to fit 4" x 6" photo - other styles of frame available.